Hello Members: We are pleased to announce the 2nd A.P.F Online Poultry Show for 2008. $100 Prize money for Champion Hardfeather, Champion Softfeather & Champion Waterfowl. The Prize money is in addition to the Engraved Trophies. Entries are NOW OPEN & we look forward to many entries. Engraved Rosettes will be awarded to the 5 "Best in Show"
Ribbons will be awarded to the 5 "Reserve Best in Show"
Last edited by EX-ADMIN on Thu Sep 04, 2008 6:24 pm, edited 4 times in total. do you have to show the wings of the A.O.S birds? A Proud Supporter Of APF. We will post the criteria for A.O.S as soon as we have it from P.A. Last edited by EX-ADMIN on Sat Aug 16, 2008 9:23 pm, edited 1 time in total. there isnt a standard for quail and phesants is there? Gee you blokes don't wast any time, straight on to the next one, 10 out of 10 fellas. oh and ladies sorry. 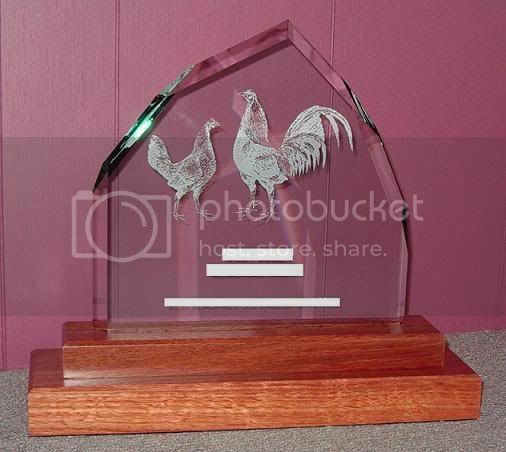 Hello Members: Below is a sample of the Trophy for A.P.F Online Show #2, Spring/Summer 2008 This is likely to be the Trophy for "Champion" Soft Feather, Hard Feather & Waterfowl & we will decide on the style soon but it will be Glass or Crystal. SWEET!!!!!!!!!!!!!!!!!!!!!!!!!!!!!!!!!!!!!!!!!!!!!!!!!!! You blokes & gals are doin a FANTASTIC job. I am glad I joined APF & I let every1 that I talk to just how good the site is. Job well done, keep up the gr8 work.